In the event of a puncture or blow-out the Tyron MultiBand is guaranteed to “lock” the tyre on the wheel rim. Tyron MultiBands are simply fitted to your existing wheel. This allows the driver to retain control of the vehicle reducing the risk of an accident and to continue to a safe place to change the wheel or seek assistance, reducing the risk of personal injury. What Does a Tyron MultiBand Look Like? A Tyron MultiBand is a patented wheel well filler that stops the tyre beads dropping into the wheel well, that is used by tyre fitters to enable a tyre to be fitted and removed. So what does a Tyron MultiBand look like? Well the image above on the right represents what would be fitted within your wheel to achieve the safety features that a Tyron Band gives. Portable Fitting Machine now available. This small, low cost collapsible machine is recommended to be kept with the vehicle so that tyre fitters around the world can easily fit and remove Tyron MultiBands when changing the tyres. All Vehicles produced in Europe from 2017 have to have TPMS fitted to the vehicle wheels. Each wheel has a sensor fitted to the tyre valve stem within the wheel and monitors the tyre pressure, sending important information back to the vehicle and alerting the driver in the event of a deflation. Tyron Bands can be fitted to any vehicle that has TPMS with the simple addition of a Tyron TPMS Bracket. This bracket allows the bands to be fitted around the TPMS sensor, still giving the benefits of the Tyron Band and the TPMS sensor combined. The Tyron Customer Care Kit should be kept with any vehicle fitted with Tyron MultiBands. 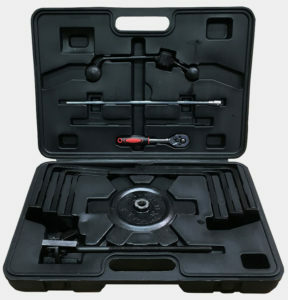 Using this kit will enable easy removal and refitting of Tyron MultiBand when changing Tyres. The Tyron Customer Care Kit Comprises of a Tyron 5mm extended ball-ended Allen Key and Multi Lingual Fitting Instruction booklet.